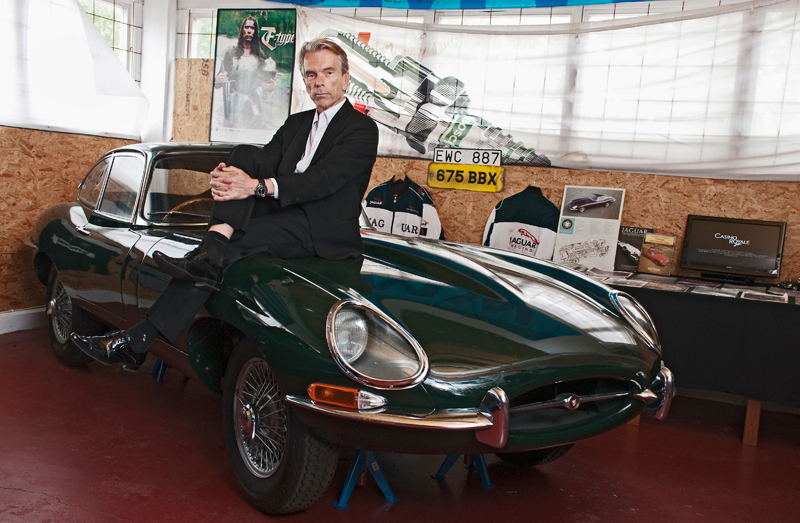 En Jaguar E-Type från 1962, samma år som en första James Bond filmen Dr No kom. 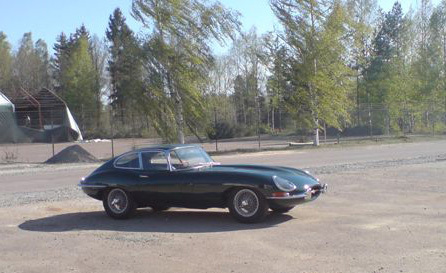 Jaguar E-Type fanns med i Casino Royale 1967 med David Niven och Peter Sellers (var ihop med bondbruden Britt Ekland). James Bond movie Casino Royale, 1967 Jaguar E-Type featured in the James Bond movie Casino Royale. 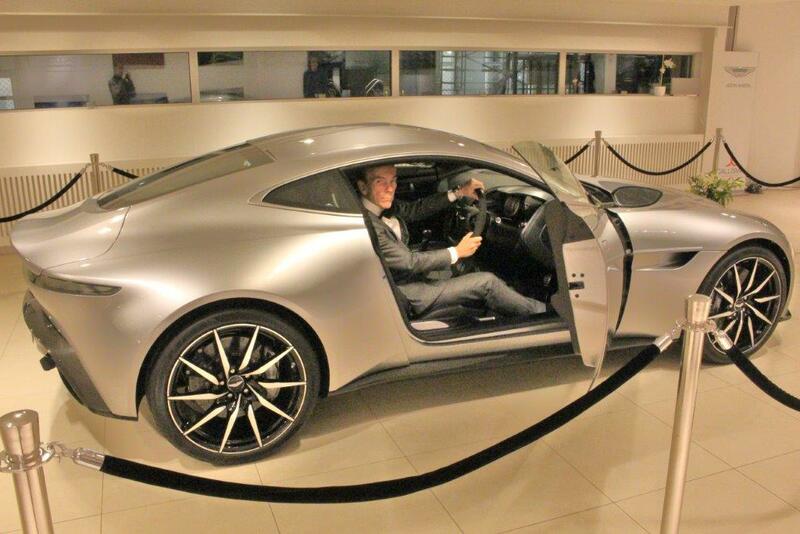 Now in James Bond 007 Museum in Sweden, Jaguar E-Type of 1962, the same year as the first James Bond movie Dr No. 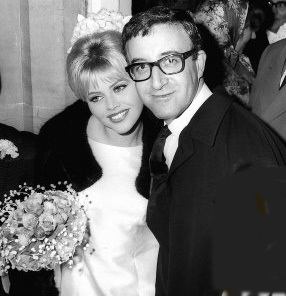 up with Bond girl Britt Ekland). Jaguar E-Type Vehicle used by a character or in a car chase Jaguar E-Type från 1962 ,samma år som en första James Bond filmen Dr No. 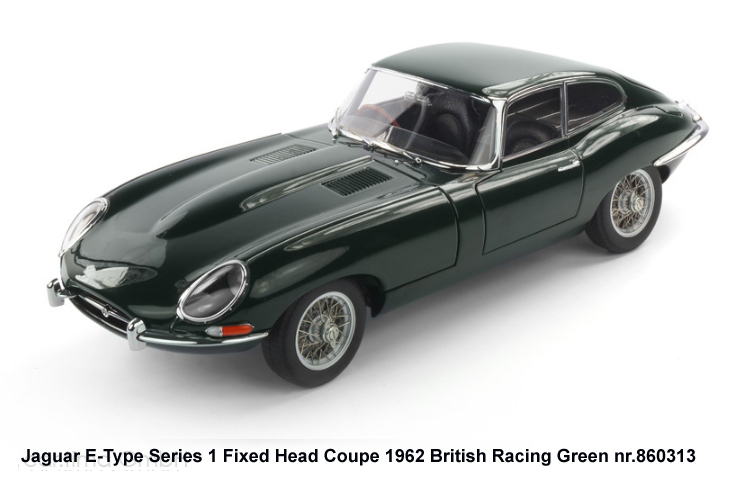 Jaguar E-type är en Jaguar-modell tillverkad 1961-1974 som har kommit att bli en klassiker bland sportbilar, särskilt i varianten som öppen bil. Av många anses modellen tillhöra de vackraste sportbilar som byggts. Modellen lanserades som en förhållandevis billig sportbil, i förhållande till sina prestanda. Konceptet tvåsitsig, bakhjulsdriven, liten och lätt kombinerat med en jättemotor på mellan 3.8 liter (rak sexa med trippel förgasare) och upp till 5,3 liters V12 gick hem både på racingbanor världen över och på gatorna, då främst hos kändisar och få andra som kunde ha råd med detta "vrålåk". Tillverkades med regelbundna uppdateringar mellan åren 1961 och 1975. Cirka 70 000 bilar har tillverkats. Modell 3.8 med XK-motor, introducerade i mars 1961 och tillverkades fram till 1964, hade för den tiden imponerande hastighet på 240 km/h. 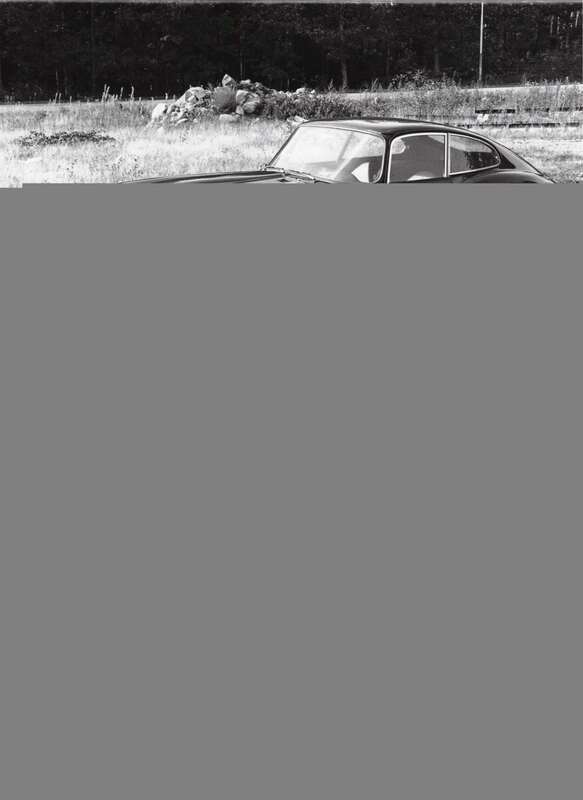 Modell 4.2, med rak sexa (1964-1968) fanns som tvåsitsig cabriolet, som en Coupé (Fixed Head Coupé) och som en "2+2" en Coupé med ett litet baksäte . En unik detalj på 3.8 och 4.2 modellerna var de tre vindrutetorkarna, på grund av den breda och låga rutan. 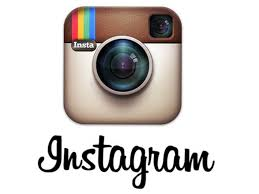 the Jaguar E-Type (UK) or XK-E (US) is a British automobile, manufactured by Jaguar between 1961 and 1974. 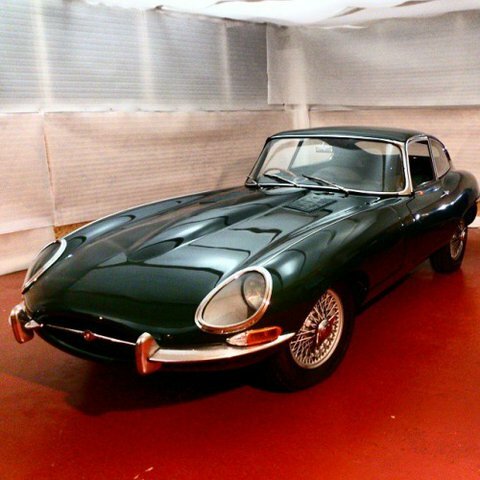 Its combination of good looks, high performance, and competitive pricing resulted in a great success for Jaguar, with more than 70,000 E-Types being sold over its lifespan, and became an icon of 1960s motoring. 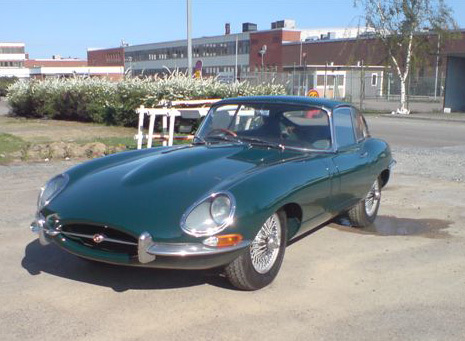 In March 2008, the Jaguar E-Type ranked first in Daily Telegraph list of the "100 ...most beautiful cars" of all time. 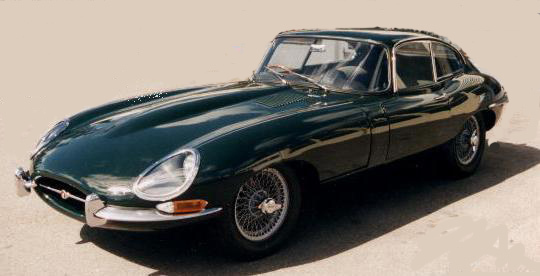 In 2004, Sports Car International magazine placed the E-Type at number one on their list of Top Sports Cars of 1960's. 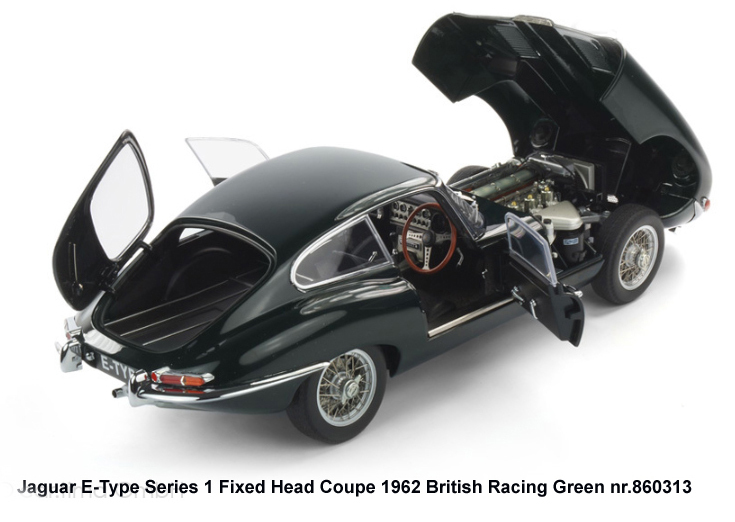 All E-Types featured independent coil spring rear suspension with torsion bar front ends, and four wheel disc brakes, in-board at the rear, all were power-assisted. Jaguar was one of the first auto manufacturer to equip cars with disc brakes as standard from the XK150 in 1958. The Series 1 can be recognised by glass covered headlights (up to 1967), small "mouth" opening at the front, signal lights and tail-lights above bumpers and exhaust tips under the licence plate in the rear. 3.8 litre cars have leather-upholstered bucket seats, an aluminium-trimmed centre instrument panel and console (changed to vinyl and leather in 1963), and a 4-speed gearbox that lacks synchromesh for 1st gear ("Moss box"). 4.2 litre cars have more comfortable seats, improved brakes and electrical systems, and an all-synchromesh 4-speed gearbox. 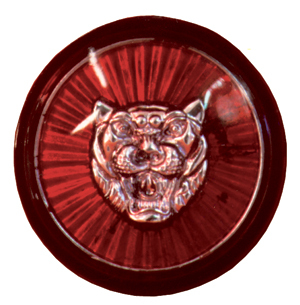 4.2 litre cars also have a badge on the boot proclaiming "Jaguar 4.2 Litre E-Type" (3.8 cars have a simple "Jaguar" badge). Optional extras included Chrome Spoked wheels and a detachable hard top for the Open Two Seater. 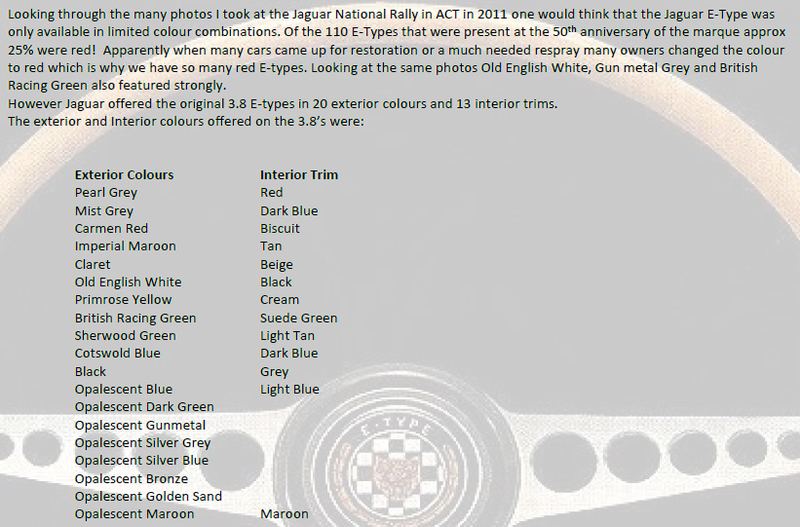 Looking through the many photos I took at the Jaguar National Rally in ACT in 2011 one would think that the Jaguar E-Type was only available in limited colour combinations. 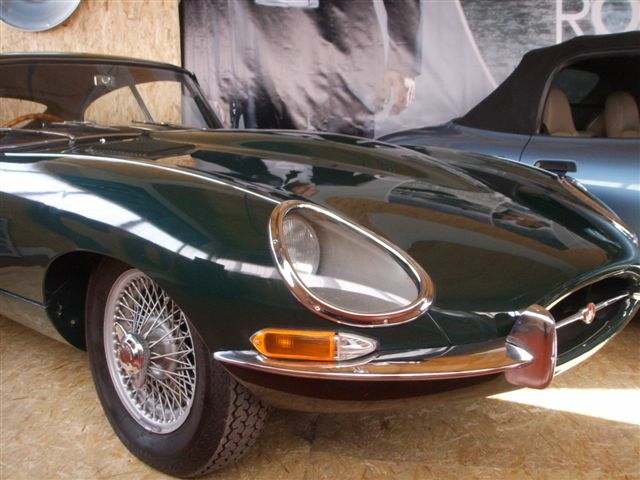 Of the 110 E-Types that were present at the 50th anniversary of the marque approx 25% were red! Apparently when many cars came up for restoration or a much needed respray many owners changed the colour to red which is why we have so many red E-types. 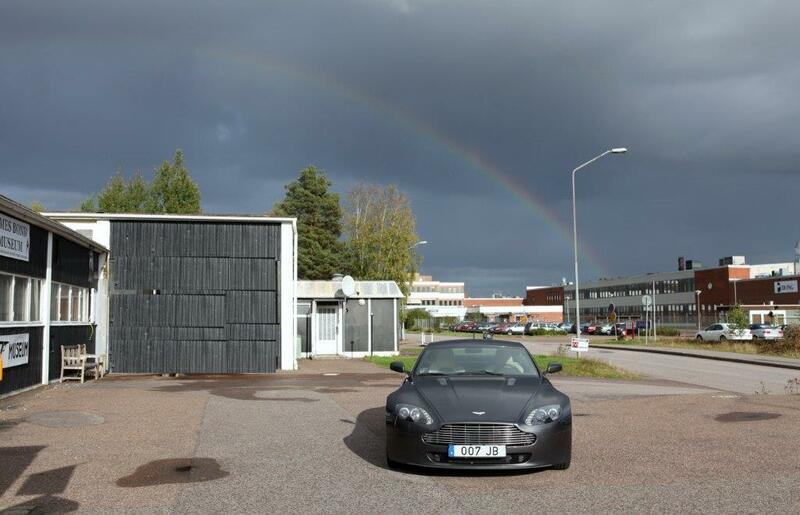 Looking at the same photos Old English White, Gun metal Grey and British Racing Green also featured strongly. 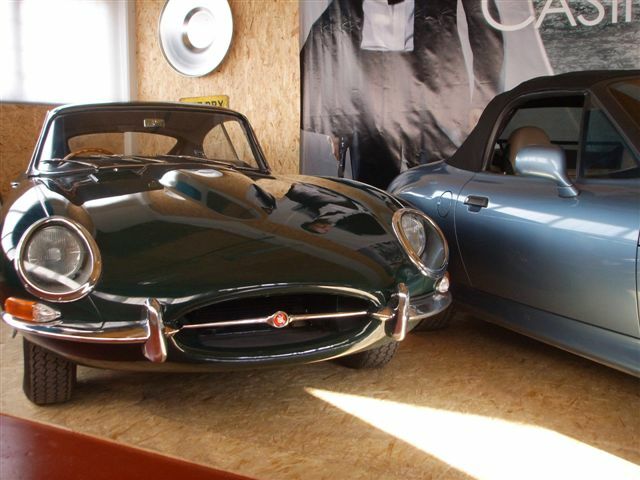 However Jaguar offered the original 3.8 E-types in 20 exterior colours and 13 interior trims.